…without the need to shop, chop, juice, blend, or clean up! 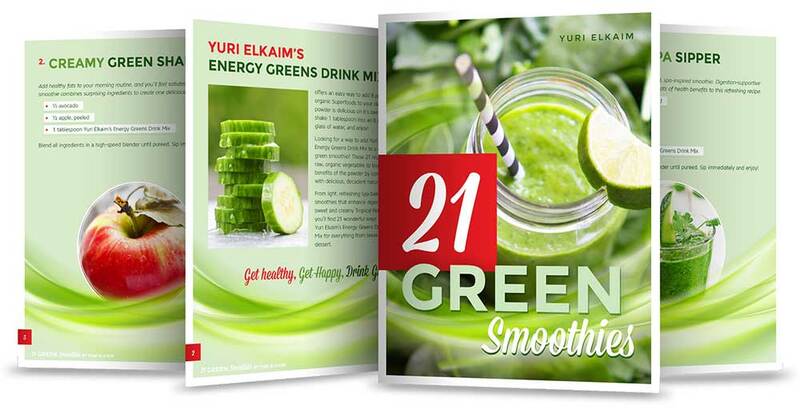 Just add ONE scoop of Yuri Elkaim’s Energy Greens to a glass of water or your favorite smoothie and get ready to look and feel your best. The 21 Energy Boosting Smoothies Recipe Guide! This full-color guide will give you 21 delicious smoothie recipes that work beautifully with your Energy Greens. If you want a green smoothie that’s a little more exciting than adding greens to your water, this is your ticket! And it will be shipped to your front door along with your Energy Greens when you order now. If you order 3 jars, you SAVE 13% off the regular price of 1 jar. PLUS, We’ll Also Send You a FREE Cookbook! 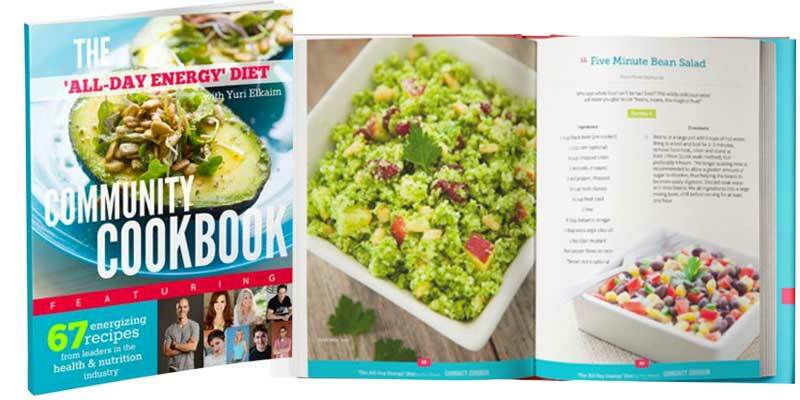 We’ll also send you a full color copy my bestselling “All-Day Energy Diet Community Cookbook” (a $19 value)…absolutely FREE! This cookbook is loaded with 67 quick, energizing “gourmet-like” meals for busy people who want to look and feel awesome. Each of these meals is allergen-free and low in sugar so you can be sure they’ll help feel great and accelerate your fat loss! Every batch of Energy Greens is made fresh and we often sell out quickly. Also, today’s price may go up in response to fluctuating commodity prices. Therefore, we recommend securing at least 3 jars with each order. Join Our Monthly Ship, Sip and Save Program and Save an additional 25% On Your Order With Free Shipping! Every 30 days, we’ll automatically send you 1, 3, or 6 jars of Energy Greens delivered to your front door. Free shipping available in the US and Canada! If, upon trying your Energy Greens, you don’t believe that it’s the smoothest and best-tasting greens powder you’ve ever tasted and aren’t completely satisfied with your experience, then simply email our customer service at info(at)totalwellnessconsulting.ca or call us at 1-888-529-9541, return your empty and unused jars, and we’ll refund your purchase. You have nothing to lose, and so much to gain…so why not join our “Unstoppable” movement and grab your Energy Greens right now? We only produce one small batch at a time so if you’re ready to finally look and feel your best by simply adding 1 scoop of greens into your morning water or smoothie, then order now before we’re sold out again. I have been drinking Yuri’s Energy Greens for the past few weeks and have enjoyed the quick energy fix once per day. In the morning I have a pint of a green smoothie. In the afternoon, I put the green energy powder into a cup of water and drink it straight up! I have truly enjoyed these greens and look forward to my afternoon energy boost! Thanks for all of the extra energy and thought that you put into making our lives so incredibly healthy! Q: How many jars should I order? These packages allow you to take advantage of our lowest possible prices today, without the worry of increasing prices and/or additional shipping fees later. Plus, if you order more than you feel you can consume, you can always give one to a friend or family member. They’ll love you for it. 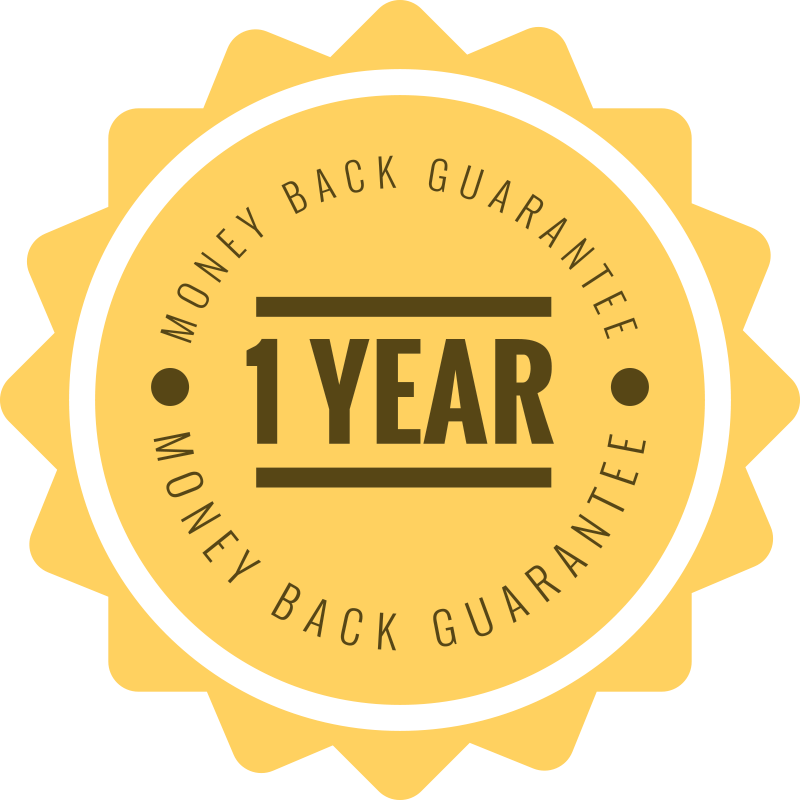 Q: How does the Ship, Sip and Save monthly autoship program work? Every 30 days, we will automatically ship 1,3,or 6 jars of Energy Greens to your door step. By signing up for the program, you will automatically save 25% off your order each month (compared to regular price) and shipping is free within the US and Canada no matter what selection you purchase. Discounted shipping rates are offered to international customers. This service can be cancelled anytime by contacting our customer concierge department. Q: How do I take these ‘Energy Greens’? Simply mix 1 tablespoon of Energy Greens with water 2-3 times per day. Additionally, you can refer to the 21 delicious smoothie recipes that you get with your order for more yummy ways to enjoy your greens. Q: What makes our greens better than others on the market? In contrast, our Energy Greens are the highest quality (using grass “juice” powder) and best tasting greens powder on the planet and I didn’t throw “the entire kitchen sink” into its superfood blend. Instead, only the TOP 8 most nutrient-dense superfoods in the world made the cut – and every single one of the superfoods comes in significant amounts that have been shown to help enhance health… protect against disease… and provide natural energy and well-being. Q: What are the ingredients inside ‘Energy Greens’? Barley Grass Juice Powder, Alfalfa Grass Juice Powder, Spirulina Powder, Chlorella Powder, Goji Berry Juice Powder, Maca Powder, Cinnamon Powder, Vanilla Powder. Q: Are your Energy Greens gluten free? Our Energy Greens do not contain any excipient or active ingredient of gluten; therefore it is technically is gluten free. However, this product has not been certified by Beyond Celiac (formerly the NFCA). Q: Is it ok to take these greens long term? Absolutely. Since each of the ingredients helps your body function as it should, it’s best to use Energy Greens daily, on-going. If you’re pregnant, breastfeeding, or on any medications please consult with your physician before using these greens long term. Q: If I have a medical condition, can I take these greens? If you take prescription medication or have a medical condition you’ll want to consult with your doctor. 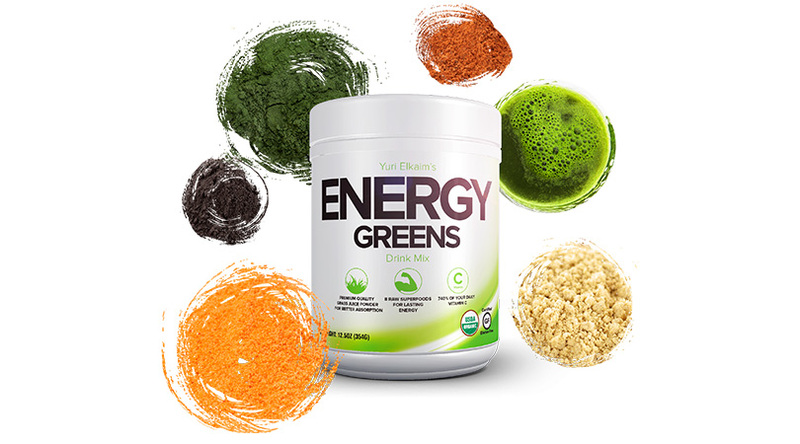 However, since these Energy Greens are 100% food-based and don’t contain any stimulants, herbs, or other contraindicated ingredients this product is considered safe and effective for nearly everyone. Q: How will these be shipped to me and how quickly? Free shipping in the US and Canada on all orders! All orders are shipped by USPS and UPS International. We provide expedited shipping which means that if you live within the United States, you will receive your order within 3-5 business days. For international orders, all orders are shipped via expedited mail (up to 5 business days) and shipped at discounted rates . Depending on the country you reside, you may be subject to duties/customs fees upon delivery. Q: What if I don’t like the taste or don’t feel like it’s working?